Ruling a cartoon kingdom is hard work, so when Disney's leading ladies want to unwind they do so by tossing fireballs and punching jerks in the face. At least, that's the idea posited by a new series of illustrations created by artist Mike V. Like so many fan-art efforts, Mr. V. decided that the best way to homage the most famous women in Disney's catalogue would be by mashing the characters up with an otherwise disparate situation: In this case these princesses have been recreated as if they were the stars of an SNES-era fighting game. This means lots of pixels, lots of flesh-baring fanservice and a certain diminutive mermaid sporting an Aquaman-style arm prosthetic. That picture embedded at top-right depicts the titular star of Cinderella as if she was filling in for Chun-Li in one of the 90s-era Street Fighter tournaments, but that's only a small glimpse of what Mike V. has created. We're all about providing due propers where applicable, so please pay a visit to the artist's official site for a full look at his work. 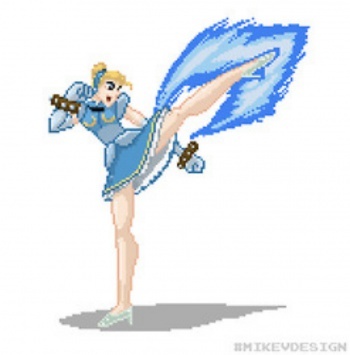 It would have been impressive enough had he merely recreated the princesses in 16-bit style, but fighting game fans will also note that the characters have been posed in ways that directly mimic famous virtual fighters. The comments are below and whoever can name the most references wins a big shiny bowl of absolutely nothing. Good luck!